Star Wars fans, tree huggers, and perpetual children rejoice, an Oregon man living in Cave Junction has done what many of us have long dreamed of doing. 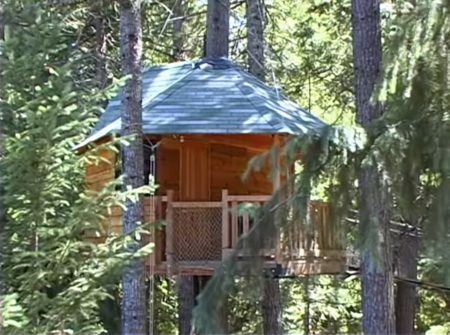 Michael Garnier has built what might possibly be the largest concentration of treehouses in the world. Dubbed the “Ewok Village“, the collection of houses complement the state’s “tree-mendous” and “tree-riffic” forests. After leaving the Army from his post as a Green Beret medic, Garnier decided that he wanted to make a living off of the scenery without having to cut it down in the process. He loved to work with wood, and began crafting picture propellers that use the eye’s natural responses towards the rapid shift between light and shadow to produce what he refers to as an “organic, psychedelic kaleidoscope”. After trying his hand at constructing fences, pole barns, and furniture, Garnier found that renting his treehouses as vacation lodgings allowed him an income and a way to give people a new perspective on how to use the land. He also sells the parts and plans of his own invention for those who wish to construct their own mansion in the branches. Designed to work with the tree’s natural biology, each house incorporates techniques that allow for the structures to become a part of the plant’s anatomy. Eventually, attaching bolts and supports merge with the trunk and branches, creating the least obtrusive and strongest possible foundation for the dwellings. Interconnected houses utilize sliding brackets that accommodate for wind and growth. Complete with furnishings, spiral staircases, toilets, and windows opening onto the canopy, the houses resemble comfortable, upscale cabins. Bridges connect each residence, and luggage and cleaning supplies are hoisted from the ground by ropes and pulleys. His own house is an 1800 sq foot building that is supported by seven trees and may be the largest treehouse ever constructed. Between Garnier’s prolific use of tree puns, amazing houses, and reportedly amazing meals cooked at this unique bed and breakfast, I am longing for an excuse to visit rural Oregon. Branch out from a boring, tradition hotel or camping tent and leaf for a trip for the world’s most incredible treesort! Visit the Tree Houses website for complete details.